The article shown below summarises what was said at the Sidmouth town council meeting on 7 February 2005. Some local people thought the Herald would be too frightened to report the behaviour of the chairman of the town council. They actually printed nearly half a page. In effect, Councillor Reed launched a personal attack on a member of the public who asked a polite question under the council's new 'public forum' arrangements - and at a time when electors had been urged to take more interest in what went on within the council! THE seeds were sown for an angry exchange on Monday over Sidmouth Town Council's decision to spend around �,000 on Britain in Bloom, but only �000 on this year's folk festival. Town council chairman Tony Reed swapped heated words with Dr Stephen Wozniak, who suggested the council pruned its floral budget to �000 and gave more to folk week. Mr Reed described Dr Wozniak's observations as "negative and destructive". 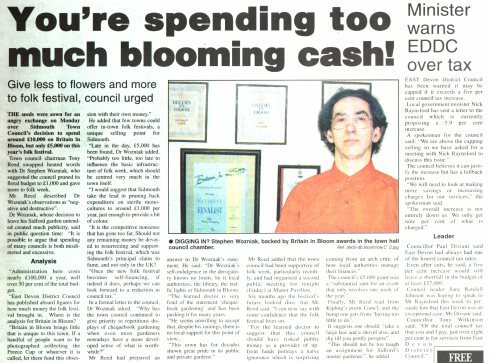 Dr Wozniak, whose decision to leave his Sidford garden untended created much publicity, said in public question time: "It is possible to argue that spending of many councils is both misdirected and excessive. "Administration here costs nearly �0,000 a year, well over 50 per cent of the total budget. "East Devon District Council has published absurd figures for how much money the folk festival brought in. Where is the analysis for Britain in Bloom? "Britain in Bloom brings little that is unique to this town. If a handful of people want to be photographed collecting the Preece Cup or whatever it is called, let them fund this obsession with their own money." He added that few towns could offer in-town folk festivals, a unique selling point for Sidmouth. "Late in the day, �000 has been found, Dr Wozniak added. "Probably too little, too late to influence the basic infrastructure of folk week, which should be centred very much in the town itself. "I would suggest that Sidmouth take the lead in pruning back expenditure on sterile mono-cultures to around �000 per year, just enough to provide a bit of colour. "It is the competitive nonsense that has gone too far. Should not any remaining money be devoted to resurrecting and supporting the folk festival, which was Sidmouth's principal claim to fame, and not only in the UK? "Once the new folk festival becomes self-financing, if indeed it does, perhaps we can look forward to a reduction in council tax." In a formal letter to the council, Dr Wozniak asked: "Why has the town council continued to give priority to repetitious displays of chequebook gardening when even most gardeners nowadays have a more developed sense of what is worthwhile?" Mr Reed had prepared an answer to Dr Wozniak's statement. He said: "Dr Wozniak's self-indulgence in the derogatory knows no limits, be it local authorities, the library, the traffic lights or Sidmouth in Bloom. "The learned doctor is very fond of the statement 'chequebook gardening' and has been pushing it for many years. "This town has for decades shown great pride in its public and private gardens." Mr Reed added that the town council had been supportive of folk week, particularly recently, and had organised a second public meeting for tonight (Friday) at Manor Pavilion. Six months ago the festival's future looked dire, but Mr Reed said: "I can now say with some confidence that the folk festival lives on. "For the learned doctor to suggest that this council should have risked public money as a provider of up-front funds portrays a naive ignorance which is surprising coming from an arch critic of how local authorities manage their finances." The council's �000 grant was a "substantial sum for an event that only involves one week of the year." Finally, Mr Reed read from Kipling's poem Camel, and the hump one gets from "having too little to do". It suggests one should ''take a large hoe and a shovel also, and dig till you gently perspire". All this stuff makes them nuts - and when they get nuts they overreact...Every time they open their mouths, we sell 3000 more copies.... And they don't get it.... They don't understand they're our best PR. So we'd like to thank the UN."